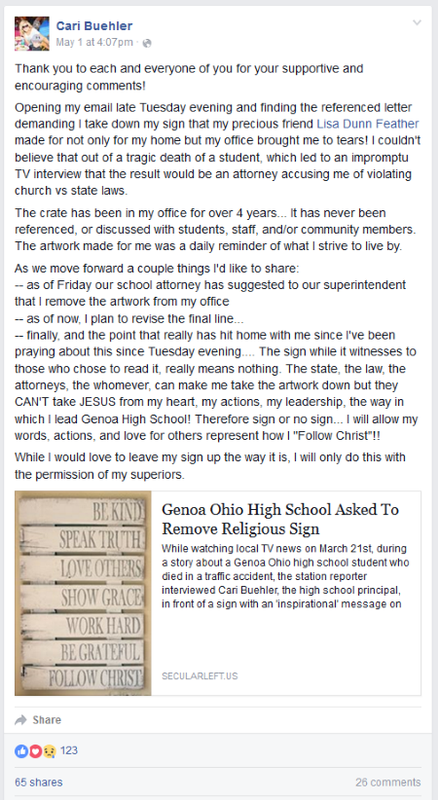 In a public Facebook post on May 1st, Genoa High School Principal, Cari Buehler, complained about having to take down the sign. Thank you to each and everyone of you for your supportive and encouraging comments! Opening my email late Tuesday evening and finding the referenced letter demanding I take down my sign that my precious friend Lisa Dunn Feather made for not only for my home but my office brought me to tears! I couldn’t believe that out of a tragic death of a student, which led to an impromptu TV interview that the result would be an attorney accusing me of violating church vs state laws. The crate has been in my office for over 4 years… It has never been referenced, or discussed with students, staff, and/or community members. The artwork made for me was a daily reminder of what I strive to live by. — finally, and the point that really has hit home with me since I’ve been praying about this since Tuesday evening…. The sign while it witnesses to those who chose to read it, really means nothing. The state, the law, the attorneys, the whomever, can make me take the artwork down but they CAN’T take JESUS from my heart, my actions, my leadership, the way in which I lead Genoa High School! 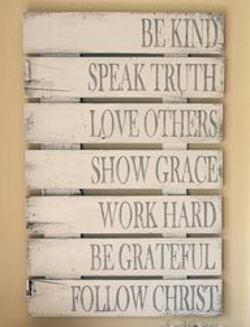 Therefore sign or no sign… I will allow my words, actions, and love for others represent how I “Follow Christ”!! While I would love to leave my sign up the way it is, I will only do this with the permission of my superiors. I will say at the beginning that I’m sure Buehler is a good person who takes her job seriously in providing her students the best education she can in her building. But she isn’t immune from making mistakes. I’m not surprised that her religious beliefs bleed into her paid job as principal. And that is one of the problems with a sign saying “Follow Christ” in her office. It doesn’t matter how long the sign had been up in her office – which is not totally private. It also isn’t relevant who made it or gave it to her. It isn’t clear that the sentiment is meant only for her. When she writes “The sign while it witnesses to those who chose to read it, really means nothing” she actually contradicts herself. If the sign really meant nothing then it wouldn’t be witnessing to those who choose to read it. In fact she wants to subtly give testimony as highly religious people are wont to do. The sign isn’t some inert piece of art. If she really wanted to express her religion on a personal level, as she is allowed to do, she could wear a cross, for example, have a personal Bible at her desk, or even a coffee mug with an image of the “Follow Christ” sign. Making sure a teacher or administrator doesn’t proselytize to students has never EVER meant the teacher or administrator had to “take JESUS from [their] heart”. If you can’t do the job you are being paid for, without taking a break from trying to recruit or convert new people to your religion, then you probably need a new job. It reminds me of people who complain they can’t smoke while eating at a restaurant. If you can’t hold off smoking for a couple of hours then you have a problem. I had to kind of laugh reading one of the comments to Buehler’s Facebook post where someone tried to say that rules on religious expression in the office of the US Department of Labor applies to a public school office. Public schools are where children of all different religions and no religion come together as part of the compulsory education requirement in our state. It is because of this compulsory nature of the public schools we must be very careful when religion is concerned. That’s why any religion expression in a public school is more strictly controlled than in a work place. This isn’t new material, as my teachers use to say. You would think one of the training sessions teachers and administrator get would be how not to violate the 1st amendment at school. Just on the news one might hear a story or two each year of teachers violating the law. Ohio had a problem with a Jesus picture in 2013. The difference is the school board there fought the removal request and cost the tax payer thousands of dollars in legal fees. They still had to remove the picture. 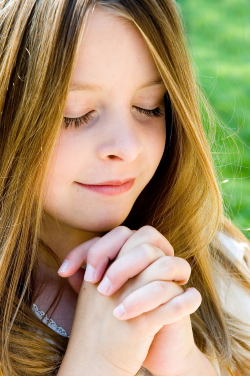 I think a separation of church and state group should put together information that would explain to parents, teachers, and administrator the current state of the law. Genoa High School Principal Cari Buehler needs a refresher course. 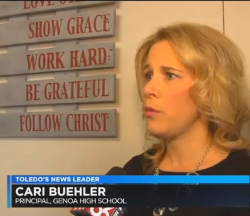 Principal Buehler’s post didn’t answer the question of why she was interviewed in front of the sign in the first place. There wasn’t a Genoa High logo on a wall she could have stood in front of or a school sign elsewhere???? Either the reporter was looking for a mushy human interest angle on the story which is possible since it was about a student dying in a car accident, or Buehler picked the location to ‘send a message’. Because the TV story drew attention to the sign it had to be removed.